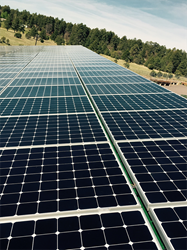 Sun Valley Solar Solutions recently unveiled another successful clean energy installation with commissioning of a 115kW solar array at the Navopache Electric Cooperative's (NEC) headquarters near Lakeside, Arizona. 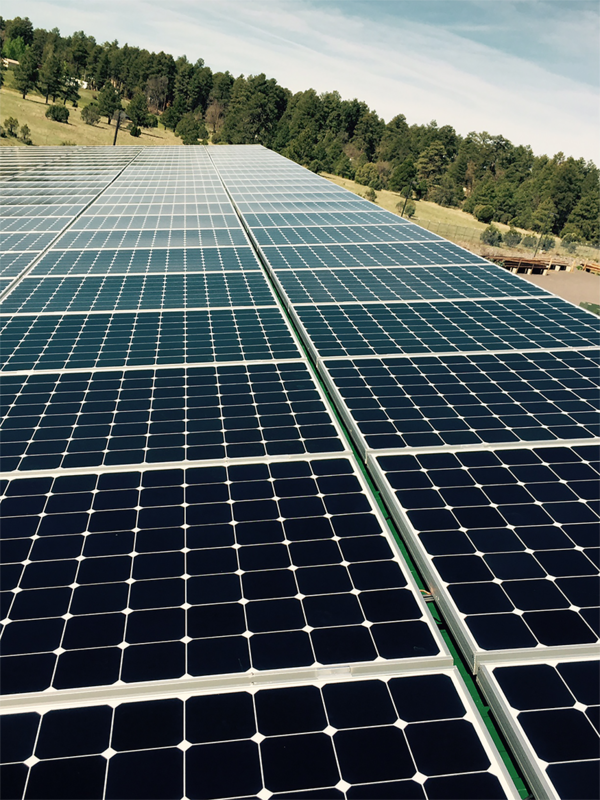 NEC’s latest solar installation further solidifies their position among a growing list of utilities that are increasing their clean energy capacity through a concerted investment in solar. As a non-profit, member-owned power distribution cooperative, NEC serves more than 32,000 members and approximately 40,000 meters across the White Mountains of eastern Arizona and western New Mexico. NEC’s latest solar initiative joins three existing solar installations executed by the utility in recent years. “We were already planning to add shade to our parking area when we decided to combine that effort with another solar investment,” explained Randall Lewis, who served as NEC’s project manager for their latest green energy effort. “We’ve seen significant impact from our four previous solar projects, and were eager to make a similar clean energy investment at our main headquarters. While the NEC project attracted interest from solar design and installation firms across the southwest, the contract was ultimately awarded to Chandler-based Sun Valley Solar Solutions.“Sun Valley Solar was the most responsive, offered a high degree of technical understanding, and offered a really great balance of value and quality,” said Lewis. 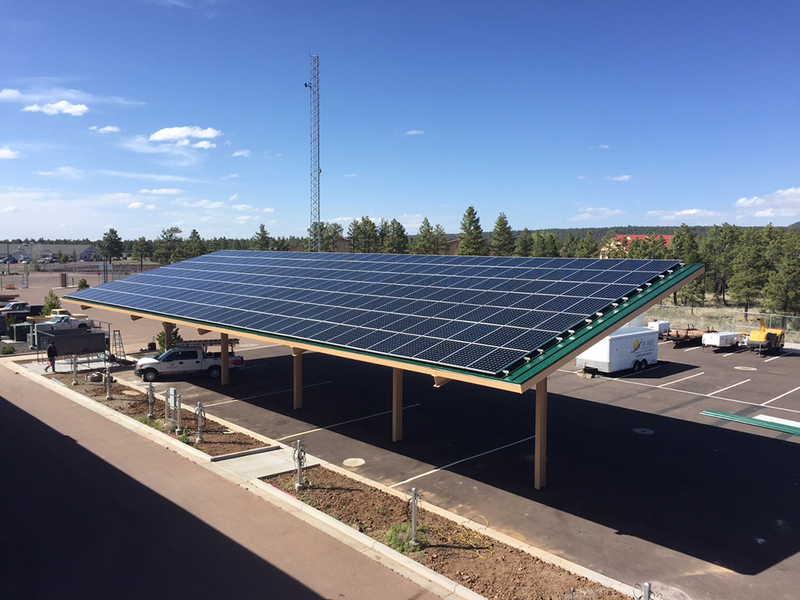 The SunPower modules are installed on two custom-engineered parking structures that also provide shade for the utility’s fleet of boom trucks and employee vehicles. Construction broke ground in late 2014, with asphalt, main support structures, conduit, and trenching completed before cooler temperatures put the project in hiatus until spring. Overhead structures, panels, and inverters were installed with grid connection and commissioning completed by Summer 2015. After more than six months of operation, NEC couldn’t be happier with their decision to go solar. “NEC is very committed to solar, and we’re proud to have taken another bold step toward a cleaner and more sustainable energy future for our company and our community,” concluded Randall. Solar modules were installed on two custom-engineered parking shade structures. The final design incorporates more than 356 SunPower solar modules.